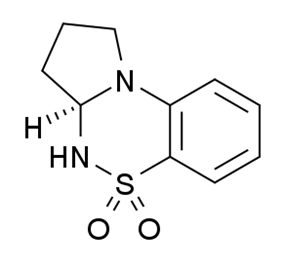 S-18986 is an ampakine drug related to cyclothiazide. It has nootropic and neuroprotective effects in animal studies, and induces both production of BDNF and AMPA-mediated release of noradrenaline and acetylcholine in the hippocampus and frontal cortex of the brain. ^ Lockhart B, Iop F, Closier M, Lestage P (August 2000). "(S)-2,3-dihydro-[3,4]cyclopentano-1,2,4-benzothiadiazine-1,1-dioxide: (S18986-1) a positive modulator of AMPA receptors enhances (S)-AMPA-mediated [3H]noradrenaline release from rat hippocampal and frontal cortex slices". European Journal of Pharmacology 401 (2): 145–53. ^ Lebrun C, Pillière E, Lestage P (August 2000). "Effects of S 18986-1, a novel cognitive enhancer, on memory performances in an object recognition task in rats". European Journal of Pharmacology 401 (2): 205–12. ^ Dicou E, Rangon CM, Guimiot F, Spedding M, Gressens P (April 2003). "Positive allosteric modulators of AMPA receptors are neuroprotective against lesions induced by an NMDA agonist in neonatal mouse brain". Brain Research 970 (1-2): 221–5. ^ Rosi S, Giovannini MG, Lestage PJ, Muñoz C, Corte LD, Pepeu G (May 2004). "S 18986, a positive modulator of AMPA receptors with cognition-enhancing properties, increases ACh release in the hippocampus of young and aged rat". Neuroscience Letters 361 (1-3): 120–3. ^ Bourasset F, Bernard K, Muñoz C, Genissel P, Scherrmann JM (August 2005). "Neuropharmacokinetics of a new alpha-amino-3-hydroxy-5-methyl-4-isoxazole propionic acid (AMPA) modulator, S18986 [(S)-2,3-dihydro-[3,4]cyclopentano-1,2,4-benzothiadiazine-1,1-dioxide], in the rat". Drug Metabolism and Disposition: the Biological Fate of Chemicals 33 (8): 1137–43. ^ Béracochéa D, Philippin JN, Meunier S, Morain P, Bernard K (July 2007). "Improvement of episodic contextual memory by S 18986 in middle-aged mice: comparison with donepezil". Psychopharmacology 193 (1): 63–73. ^ Marighetto A, Valerio S, Jaffard R, Mormede C, Muñoz C, Bernard K, Morain P (May 2008). "The AMPA modulator S 18986 improves declarative and working memory performances in aged mice". Behavioural Pharmacology 19 (3): 235–44. ^ Kelly SJ, Bernard K, Muñoz C, Lawrence RC, Thacker J, Grillo CA, Piroli GG, Reagan LP (January 2009). "Effects of the AMPA receptor modulator S 18986 on measures of cognition and oxidative stress in aged rats". Psychopharmacology 202 (1-3): 225–35. ^ Gupta SK, Mishra R, Kusum S, Spedding M, Meiri KF, Gressens P, Mani S (April 2009). "GAP-43 is essential for the neurotrophic effects of BDNF and positive AMPA receptor modulator S18986". Cell Death and Differentiation 16 (4): 624–37. ^ Destot-Wong KD, Liang K, Gupta SK, Favrais G, Schwendimann L, Pansiot J, Baud O, Spedding M, Lelièvre V, Mani S, Gressens P (September 2009). "The AMPA receptor positive allosteric modulator, S18986, is neuroprotective against neonatal excitotoxic and inflammatory brain damage through BDNF synthesis". Neuropharmacology 57 (3): 277–86.